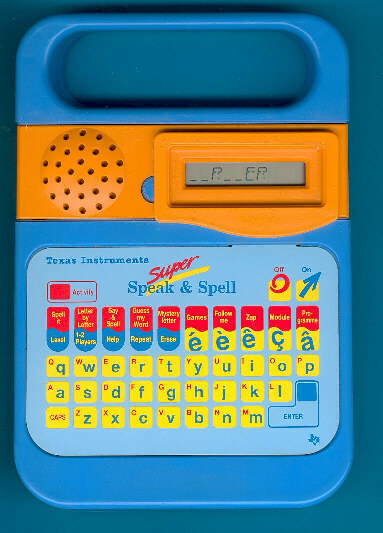 Size: 10.0" x 7.0" x 1.3"
This wonderful hybrid uses the housing of the original Speak & Spell from 1980 with the modern electronics of the first Super Speak & Spell. Don't miss the El Loro Profesor and El Loro Parlanchin with their wonderful Spanish language, the French speaking La Super Dictée Magique and finally the Italian speaking Grillo Parlante Piu. Tired of the blue line? Believe it or not, customers in China enjoyed already in 1990 their own "Professor" in bright red colors. © Joerg Woerner, December 5, 2001. No reprints without written permission.